The prominent veins shown here on the lower leg are varicosities. 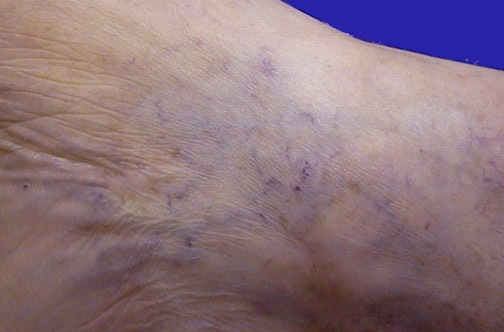 Varicose veins are a common problem with aging. The venous valves become incompetent. There may be muscular atrophy with less tone to provide a massage effect on the large superficial veins, and skin becomes less elastic with time. Hydrostatic pressure from standing for long periods exacerbates the problem.